Here you are, all fired up to help people buy and sell homes. You know that if you want customers you need to get marketing, and you want to get started. But what will you say to convince them to work with a new agent? All around you, agents are trading on their years of experience and telling both buyers and sellers that experience means they're the best agent to choose. You know that isn't necessarily true - at least you know it if you've been watching what goes on around you. Some of those seasoned agents aren't doing a good job at all! But you can't say that. The fastest way to make yourself look like a loser is to put someone else down. So what can you do? First, don't try to hide the fact that you're new. Use it to your advantage instead. You do have some advantages to offer - the first being enthusiasm. Agents who have been in the business for 20 years don't generally have the spark that you have, nor do they have the fascination with viewing homes. They may not even have current knowledge of real estate laws, and they may be completely out of touch with the new electronic methods of communication. So don't let them scare you. Just get busy showing those buyers why you have what it takes to help make their dreams come true. You can do it with the "New Agent to Buyers" Letters. This letter set will stress the many benefits you bring to your buyers, and position your "newness" as an advantage to them. The "New Agent to Buyers" letter set consists of 5 letters, two buyer checklists, and the special report: "How to Choose a Realtor." And at only $37 for the set, each document costs you less than a fast-food lunch. Letter # 1: Choosing an agent - The advice buyers get is confusing and conflicting. Why you offer what they need. Letter # 2: The Three-pronged approach to finding a home tells how you use the checklists, pay attention to their wants, and constantly monitor the market on their behalf. Letter # 3: Explains your desire to find them the best home for the lowest price, even when it means spending more time and earning less money by helping them purchase a foreclosure or a short sale. Letter # 4: Communication - Lets your buyers know that you'll stay in touch, and that you'll communicate in the manner they prefer. 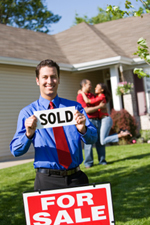 Letter # 5: A recap of the many benefits you offer - in the form of promises to your buyers. The special report: "How to Choose a Realtor." This report goes into detail about how a buyer or seller can evaluate the agent he or she is considering. You can use the "How to Choose a Realtor" report to capture leads with an autoresponder on your website, or you can begin sending to individuals you know are in the thinking stages. Either way, these letters will position you as the agent who will get the job done. So get your letters today, and get busy! P.S. You may also be interested in our New Agent to Seller Set. And...If you haven't seen the other letter sets yet, visit my real estate prospecting letters page. You'll find pre-written real estate letters for Expired Listings, Short Sale Sellers, First time buyers, FSBO's and more. P.P.S. With your purchase you'll also get a complimentary subscription to my weekly real estate marketing ezine. Of course, you can opt out any time you like.